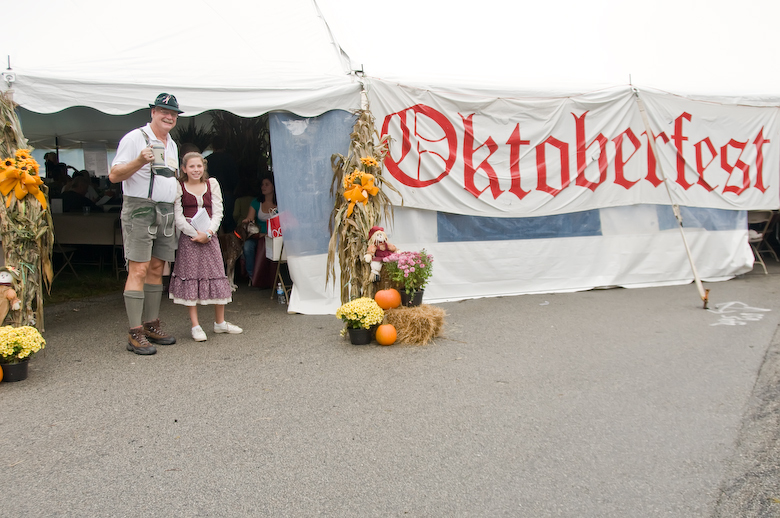 In late September each year, Oktoberfest is the place to be! 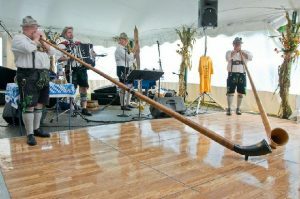 King Ludwig’s Bavarian Band sets toes tapping and feet dancing. Guests enjoy authentic German food and drink while they catch up with old friends and meet new ones. You might go home with delicious homemade treats from the bake table, win hourly raffle prizes, or offer the winning bid for silent auction items like Patriots or Celtics tickets, a wine basket, golf outing, Amalfi coast dinner, children’s art supplies, and other items. Kids get their faces painted and do spin art and other fun activities. 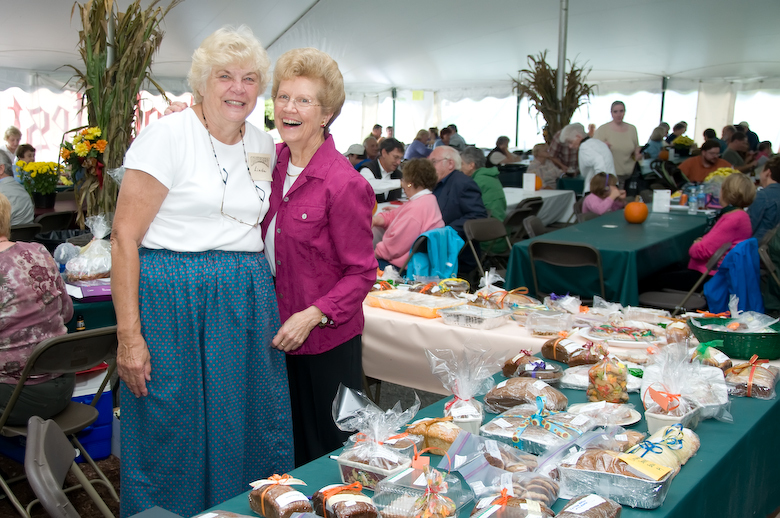 Crafters offer their wares – textiles, woodworking, jewelry and more. 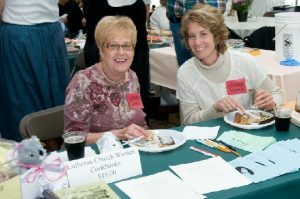 Throughout the event, representatives from agencies and organizations like Wellspring Multi-Service Center in Hull, South Shore Habitat for Humanity, and Ascentria (formerly Lutheran Social Services) are presented with a portion of the previous year’s proceeds. 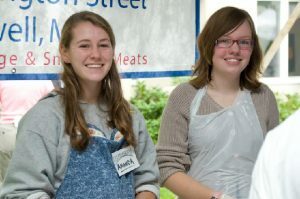 Another portion provides mission support through the New England Synod and the ELCA that helps fund new church starts (like Sanctuary in Marshfield), campus ministries at MIT and Harvard, seminaries, and more. The non-perishable food items that guests bring and their donations of money for the food banks are divided up between the Hingham Interfaith Food Pantry and Wellspring. House of Prayer especially thanks the Smoke House in Norwell and The Boston Beer Company/Curtis Liquors for their donations, and we’re grateful to all the generous sponsors who’ve helped make Oktoberfest a success each of the last thirty-two years! “When I first came to House of Prayer in 2008, Oktoberfest was one of the first things people wanted to tell me about. 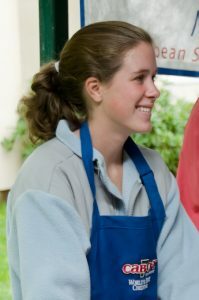 They said, ‘Wait ‘til you see the size that tent!’ and ‘You’ll be amazed by how many people come to enjoy the day and the food and the music!’ And I was told, ‘Everybody signs up to work, and lots of people do the same things every year. We’re good at this.’ And that was all true. Ed Martin still teases me about my ‘deer in the headlights’ response to just how big and busy and loud and fun and exhausting it was. I knew that a great deal of the proceeds went to charity, and I got to know about Wellspring, Habitat, Ascentria, and more. But here’s my confession. I didn’t quite get it. Yes, it was fun, and it was community outreach, and it had grown from a picnic on the front lawn to a massive undertaking that (here’s my confession) meant that the program year couldn’t really begin in September because everybody’s energy was consumed by Oktoberfest. The whole ‘charity’ thing made me uncomfortable because ‘charity’ has the connotation of being us-who-have giving to you-who-need. It’s not ‘us-in-it-together-with-you’ language. However . . . over the years, we’ve deliberately changed that language, and our relationships with the agencies that receive Oktoberfest proceeds have deepened, and they’re more collaborative. They have become more hands-on, better-informed, committed, and caring. They’re more ‘in-it-together’ relationships now. 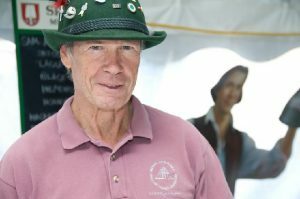 How Oktoberfest serves God’s purposes becomes more and more clear to me. The mundane and ordinary things we do bear fruit we may never gather or taste ourselves, but it nourishes others. 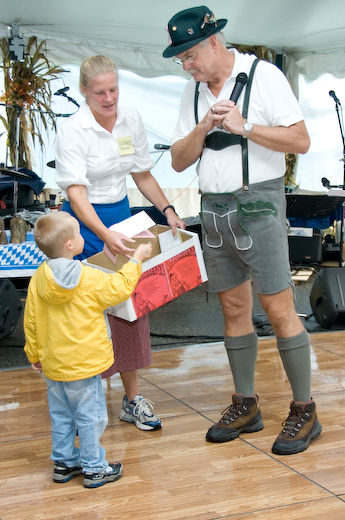 We do a million mundane things at Oktoberfest that bear fruit through our relationship with the organizations, staffs, and volunteers who are in the world doing God’s work. They do what we could never do on our own. The mundane stuff may seem superficial, but the mundane actually goes really deep. For example, that’s not just a serving of sauerkraut. It’s getting to know the person serving next to you, and it’s a friendly ‘Hello’ to the person whose plate you put that sauerkraut on. And – after that German sampler is paid for at the end of the food line, some of that money will make its way to Ascentria. And maybe a little of it will go the Good News Garage. And then the Good New Garage will repair a donated car – and actually give it to the family we helped make a fresh start. And, since now they can get to their jobs, God will have breathed new life into them and their daughter, given them hope when they had been despairing, and assured them that they are loved and not alone. See what I mean? It’s not just a serving of sauerkraut. It’s God at work through us and with us bringing hope and help to those whom Jesus calls us to love and to serve. It’s not just making something for the bake table or setting up chairs or waving someone toward a parking spot. It is, over the years, building one-seventh of a Habitat house. It’s not just cutting cakes or selling pretzels or tending the grill, it’s God at work in us and through us. It looks and feels and is mundane in the moment, but the fruit of our collective labors is food on people’s tables through Wellspring and the Hingham Food Pantry, and it is services to immigrants, refugees, people with disabilities and more through Ascentria and other agencies we support. Now I get it! Do you get it, too? 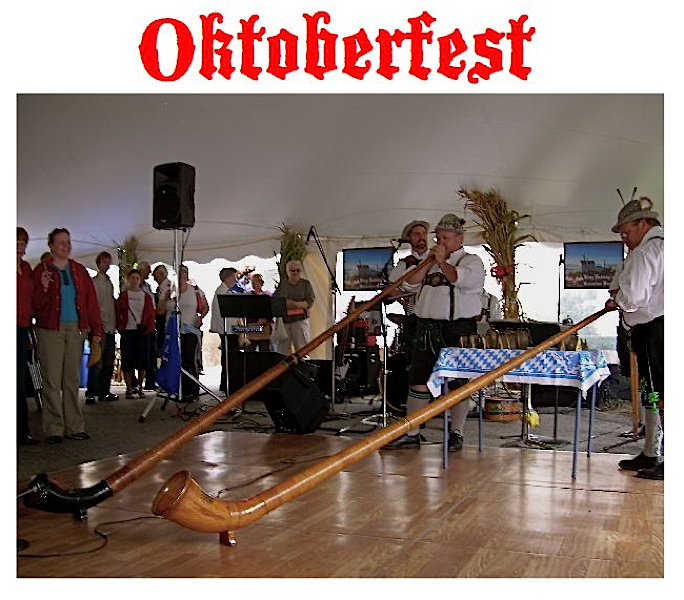 We are known for Oktoberfest, but we are shaped by Oktoberfest. Our hearts get turned toward serving God and serving our neighbors. We become more mindful of the broken places in our world and in people’s lives – and of how our proceeds and prayers and practical, hands-on, generous acts proclaim the love of God. Granted, it’s a long way from a serving of sauerkraut to a dependable vehicle, but we dare not lose sight of that connection, lest we forget that God’s purposes are being worked out through our mundane, ordinary, exhausting acts of love and service.